The type of store can be determined by the connection's prefix (or lack of it); the network and file based keystore types are historical, from earlier versions of the Floating License Server. 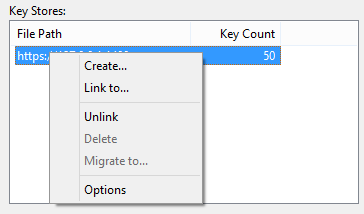 Selecting the Create... menu option allows for the creation of a new file based keystore. Selecting the Link to... menu option will prompt the user for the connection details of a Floating License Server (or key store) to be added to the list of connected stores. Selecting the Unlink menu option while a Floating License Server is selected in the list will release the Floating License Configuration Client's connection to the store and remove it from the list. Selecting the Delete menu option while a file base Key Store is selected in the Key Store list will physical and permanently delete the file used to store the keys. 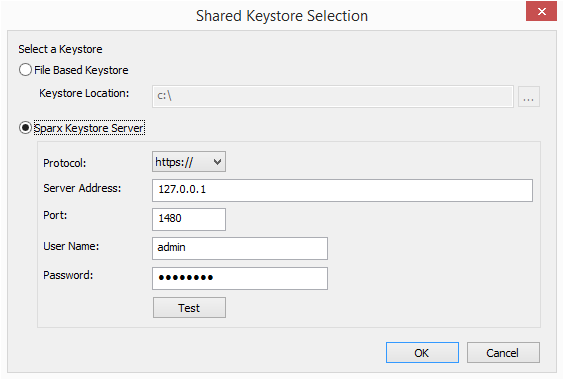 This option is disabled when the selected Keystore is either a Floating License Server or shared network KeyStore.